You’re like the naughty child in the back of the classroom; the one who always eggs the other children on… and then watches, laughing, as they get in trouble. 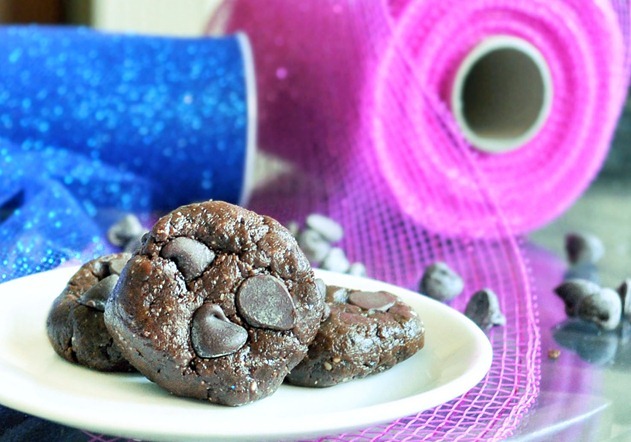 Make a chocolate version of your Peanut Butter Cookie Dough Cookies. Yes, yes I wanted to. And now that I made them and discovered how good they are? Oh boy, am I ever in trouble. Throw everything into a small food processor (double the recipe for a larger food processor) and combine until very smooth. 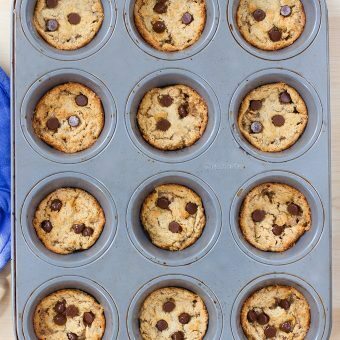 Roll into balls, cookies, bars, or simply eat shovel the dough into your mouth, straight from the machine. (I’m not the only one who does this, right? Right?) The dough can be stored on the counter, in the fridge, or in the freezer. Or in your belly. Or in my belly. On second thought, the dough can only be stored in my belly. So hand it over. 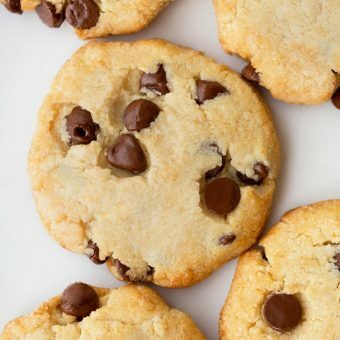 These are 100% flourless, just like my Flourless Chocolate Chip Cookies. Also, I wanted to update you on the moat I mentioned in an earlier post that I was making to protect my cookies. If anyone tries to steal my cookies, he’s got me covered. I initially had my heart set on a dragon… but all the good dragons were taken. 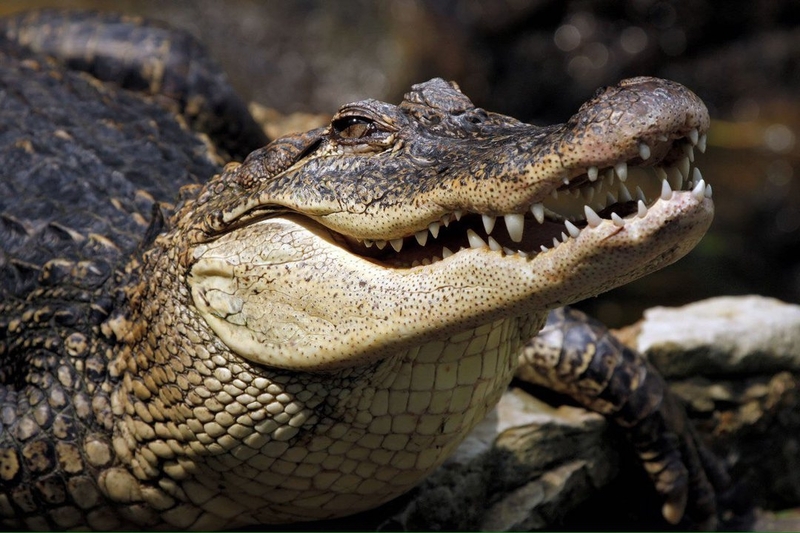 Growing up, did you ever want an exotic pet? At one point in my life, I thought it’d be the coolest thing to have a monkey. And then I went through a “Mom, I need a panda bear” stage. Through the years, I also wanted a frog, a mouse, and a horse. Apparently my childhood pets (which included rabbits, hermit crabs, hamsters, and a parrot) just weren’t exotic enough. Also: If you haven’t tried the original version of these cookies, I highly recommend checking that post out. 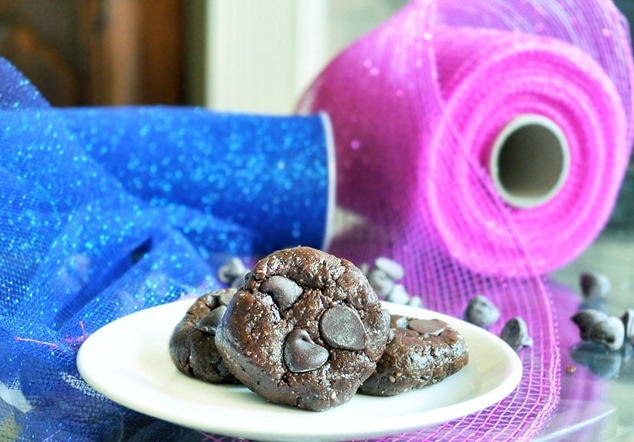 It’s one of my favorite recipes on the blog! It was only a matter of time until you choclatized these!! I like that words- cholatized, I think it’s fitting for your blog 🙂 You should patten it! For peanut butter, do you have to use the commercial type or would it be possible to use the all natural, organic, hippy dippy stuff? Finding your site was my best Christmas present this year!!! i didn’t want an exotic pet but i wanted to live in exotic places! i’ve always been super active and curious so i wanted to travel the world & be an explorer! these cookies look great! i want to try them with some protein powder mixed in! Katie, you will be the ruin of my sanity, how can I function before I have made these? Chocolate and peanut butter… 🙂 What a wonderful start to the day! I always wanted a horse growing up (what little girl doesn’t?) and my best friend had a newt that I thought was pretty cool. I loved animals so I think I probably wanted everything! My brother’s friends dad had a kangaroo for a while- I think that would be fun! As for the exotic pets… I still think a peacock would be a pretty amazing pet! Nothing beats peanut butter and chocolate… two of the best flavors paired together= amazingness! I had lots of random pets (bunnies, hermit crabs, guinea pigs, rats, mice, fish, ferrets, etc.) growing up because my sisters and I were all pet obsessed. I really did want a tiger though… like Jasmine from Aladdin! Lol. I really wanted a dolphin (or a killer whale) when I was little. I several times begged my mother for one. In my mind I even contemplated buying a huge patting pool (isn’t that what it’s called??) and have the dolphin swim around in that in my backyard. I always loved the sea and dolphins so to me that was just the ultimate pet. Haha thinking back on this makes me smile 🙂 Thanks for reminding me of my silly childhood dreams! all i can say is yes please. i really regret having just finished my last peanuts, now i need to wait for tomorrow at least, before i can make these.i don’t think i’ll make it. They look amazing! And so simple- I love the idea of using the raisins in them. Yum. Those look so good. If I don’t get a food processor soon I think I might die from lack of delicious treats. 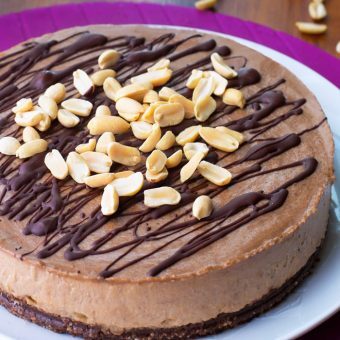 Chocolate and peanut butter is one of the best combos ever! Haha yes the beginning of this post did make me smile and chuckle. 🙂 Great intro and eventual segue into the recipe! 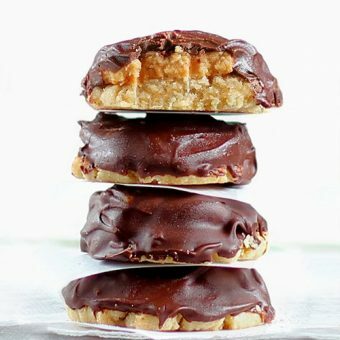 Chocolate and PB, as we all know, has always been a winning combo, so of course these have got to be awesome… just like the original version. Only, you know, ten times as awesome because they’re chocolatey. My refrigerator broke so I’m glad that these don’t have to be refrigerated! SCORE! Mmm, these sure look delicious! I’m lucky enough to live about 10 minutes away from a wholesale nut company, so I could make these with any kind of nut if I wanted to! We all know peanut butter is the best, though. 😉 Do you think these would work with golden raisins? I much prefer the taste of those. I don’t remember wanting any exotic pets, but I did want a kitten for the longest time. Now I’m lucky enough to date someone whose family fosters cats, so I’ve had a lot of chances to play with kittens. I have gotten ringworm though…yuck! At least it’s nothing serious. Uh-oh I should have seen this coming! I know how delicious the original version is, and now a chocolate version? Oh I know what I’m eating today! Earl doesn’t scare me, I’m coming to sneak a cookie! Oh no! I need a bigger crocodile! Just kidding. You are so sweet that I’ll share. It gives me an excuse to meet you :).